Sometimes, I judge a book by its cover. 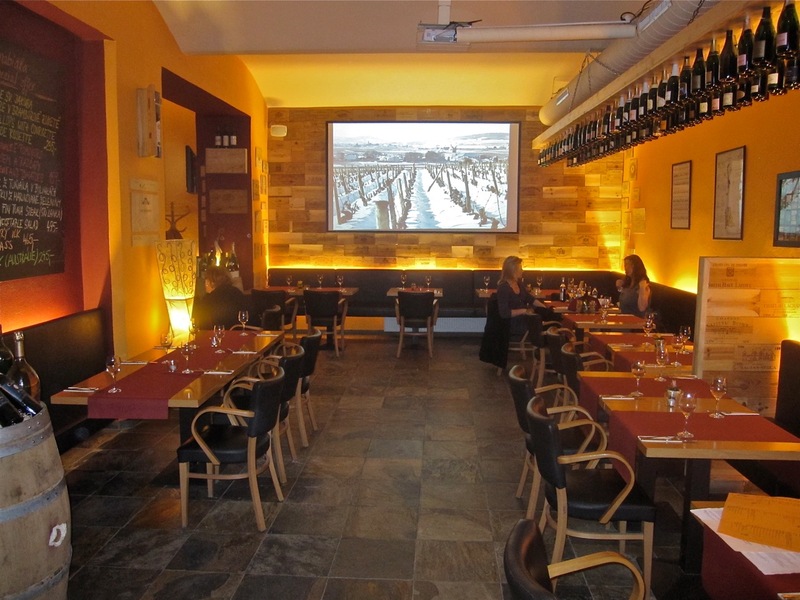 Or a restaurant by its front room. Sometimes, I learn that this is not always a good thing to do. I'd gotten a couple of recommendations about Bresto Cafe & Wine Bar over the last year. But when I glanced through the front window a long while back, it turned me off. I saw tables in a small bar area filled with members of the cell phone and cigarette set puffing away. Not my kind of place, I thought. I didn't feel the urge to try it. 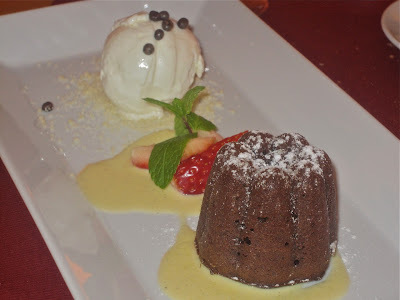 But I kept hearing positive comments about the French and Italian menu. 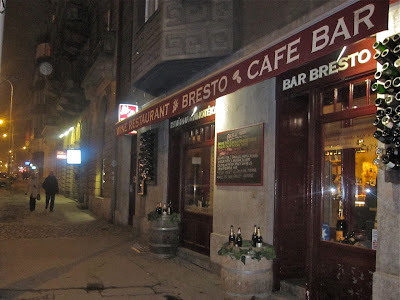 I finally broke down, looked past my preconceived notions, and made my way to the restaurant on Štěpánská, not far from Wenceslas Square. The front room was not so smoky this time. I made my way to the larger non-smoking area in the back and was more impressed. 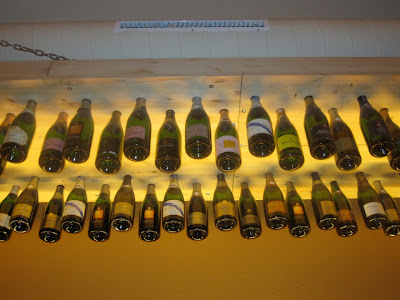 I liked the modern, cheerful, artfully lit space. There was a cool, lounge-like area further back, with walls artistically paneled with wood from wine crates. Jersey Girl met me at the restaurant for dinner. She's a foodie, a great cook, and an admittedly tough critic. True to form, she quickly made a cutting comment about the tiny paper napkins on the table. Since Bresto is a wine bar with oeno-inspired decor, she suggested we should have a bottle. I agreed. 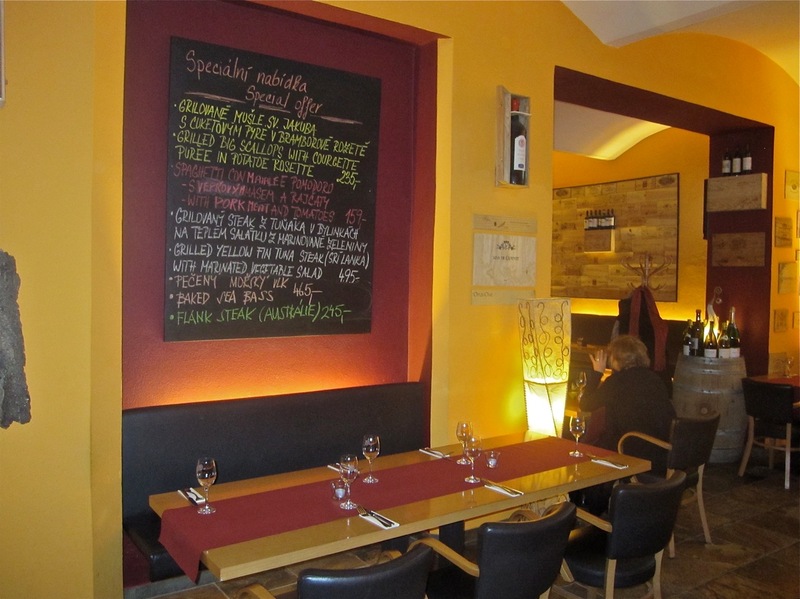 They have an extensive list with moderately priced French, Italian, Czech and other national offerings. She ordered the Estampa Riserva Syrah-Cabernet (390 CZK). We thought it was great for the price. 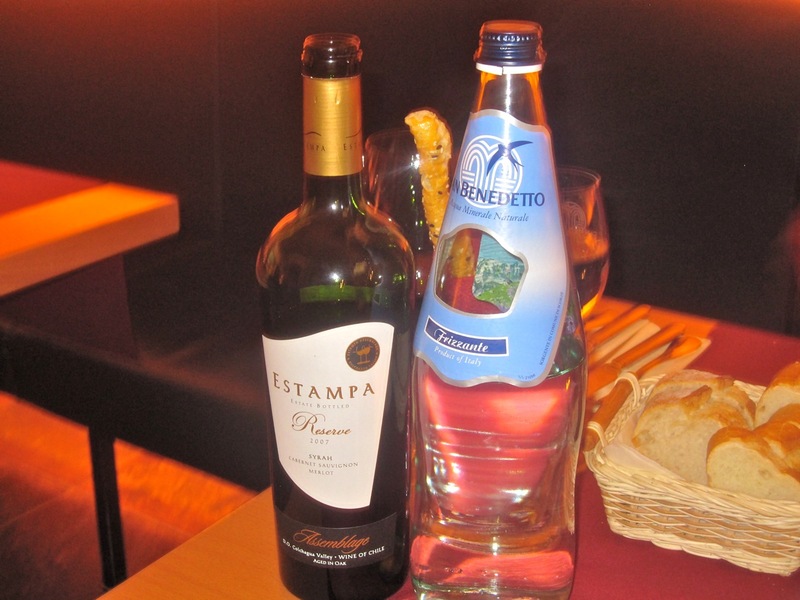 We also shared a bottle of San Benedetto sparkling water (90 CZK). 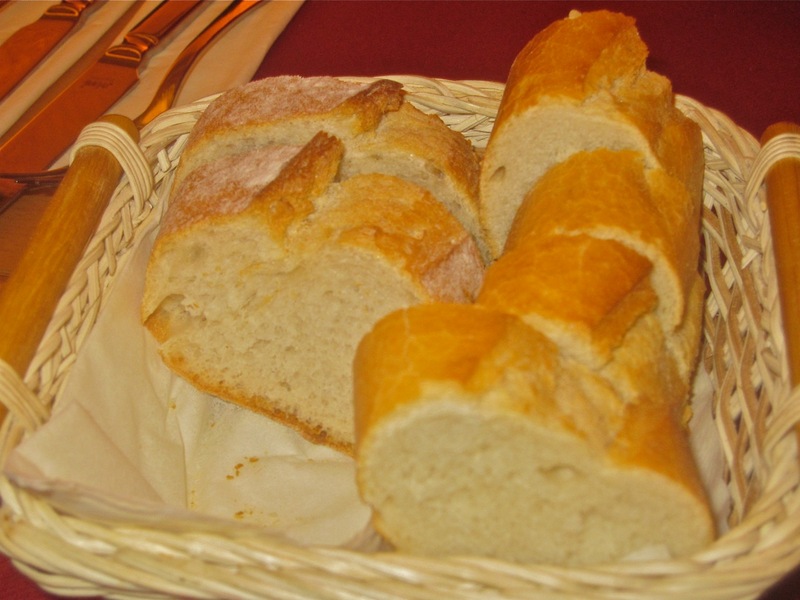 The bread basket contained fresh French baguette slices. There was a specific charge of 25 CZK for it on the bill. 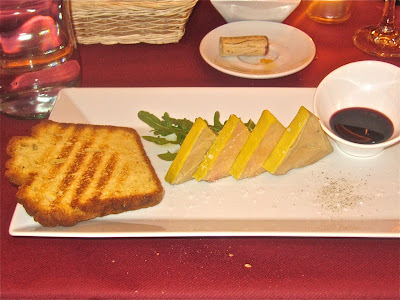 I started with the duck foie gras accompanied by Port wine reduction and toasted Brioche (195 CZK). The liver was silky smooth and delicious. I especially liked the sweet, tart, and syrupy sauce. The brioche was the real deal, but unfortunately, it was dried out and crumbly. 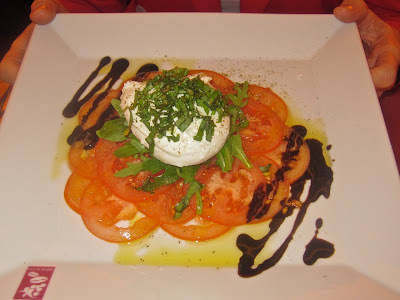 Jersey Girl tried out their Caprese salad (145 CZK). She liked it, but thought the mozzarella di bufala could have been creamier. I thought it was perfectly fine. She liked that the tomatoes were sliced so thin, making them easier to eat. I appreciated the balsamic reduction and the generous amount of chopped basil on top. I love basil and in many versions, you only get a leaf or two. 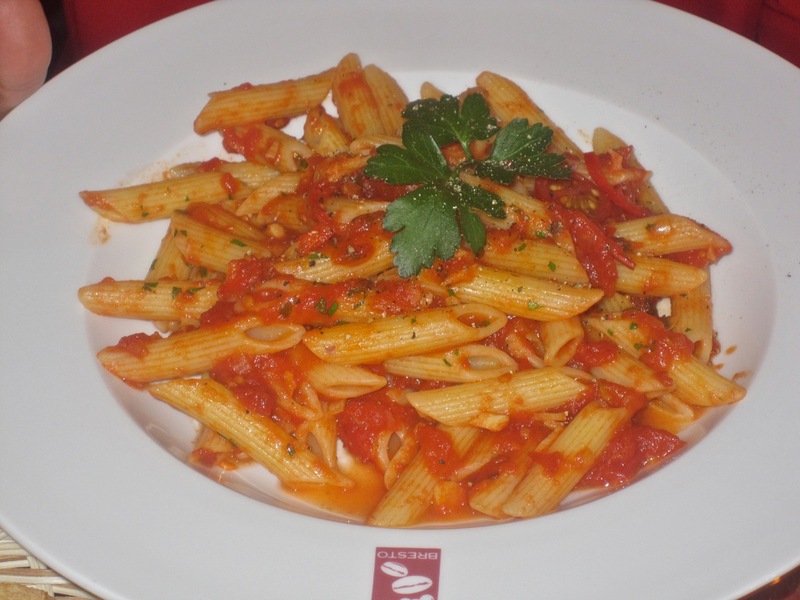 For a main course, she ordered a special of Penne Arrabbiata (159 CZK). She said she rarely finds any pasta she thinks is cooked correctly in Prague, and she proclaimed this one as perfectly al dente. We both also savored the garlicky fresh tomato sauce with a few lightly cooked cherry tomatoes. Simple but highly effective. 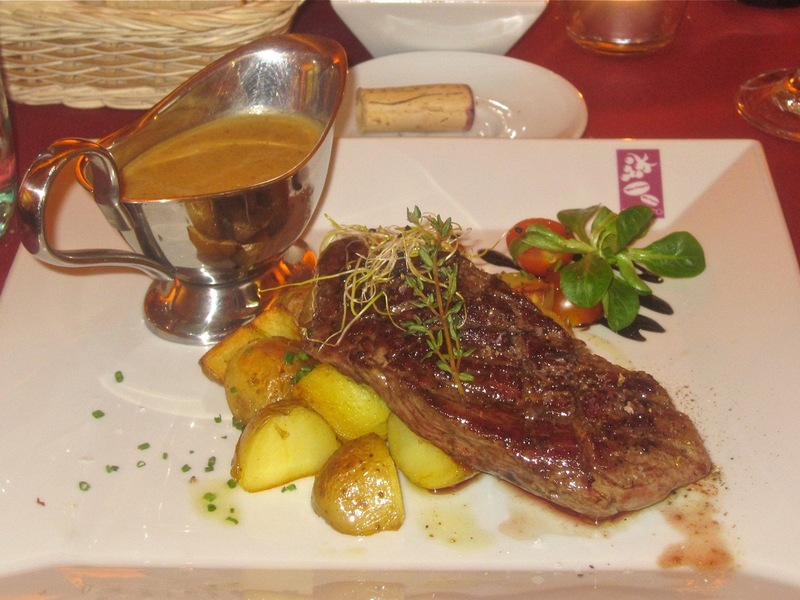 Bavette or flank steak is one of my favorites, so I had that (295 CZK). 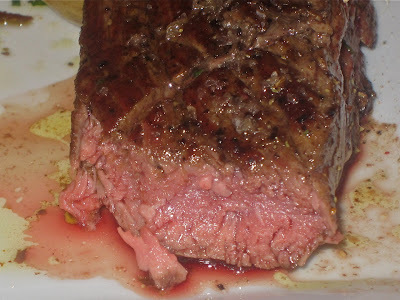 It was tender and delicious, with perfect levels of salt, pepper, and pan flavors. I asked for medium rare. I'd say it was on the rare side, but the beef was of such quality, I was actually glad. It came with lovely roasted Grenaille potatoes and a creamy, dreamy pepper sauce. It was among the creamiest and most delicious I've had. 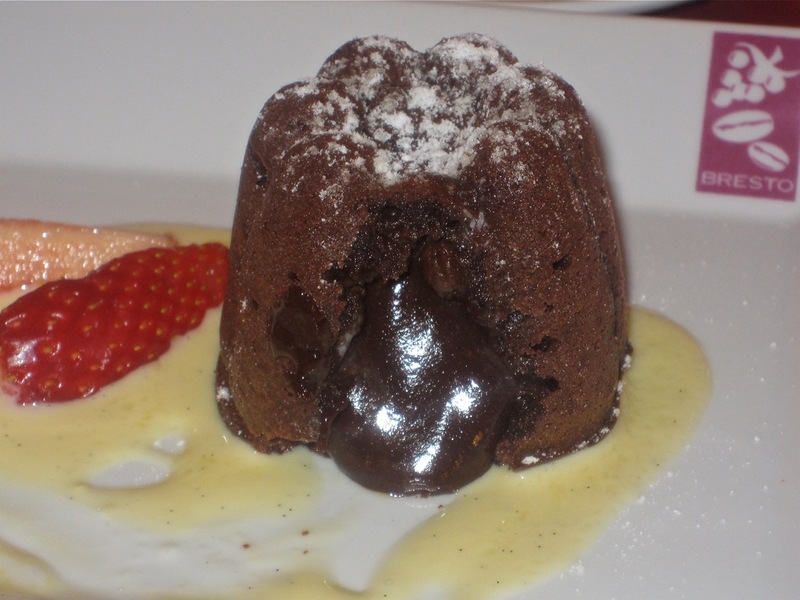 For dessert, I had the chocolate moelleux, also known as a fondant (135 CZK). It was a good, rich iteration with decent vanilla ice cream. With coffee, the bill came to 1471 CZK before tip. Not bad considering it included a bottle of wine. We both liked our dinner so much that we decided to return the following week with Jersey Girl's husband, the English Patient. 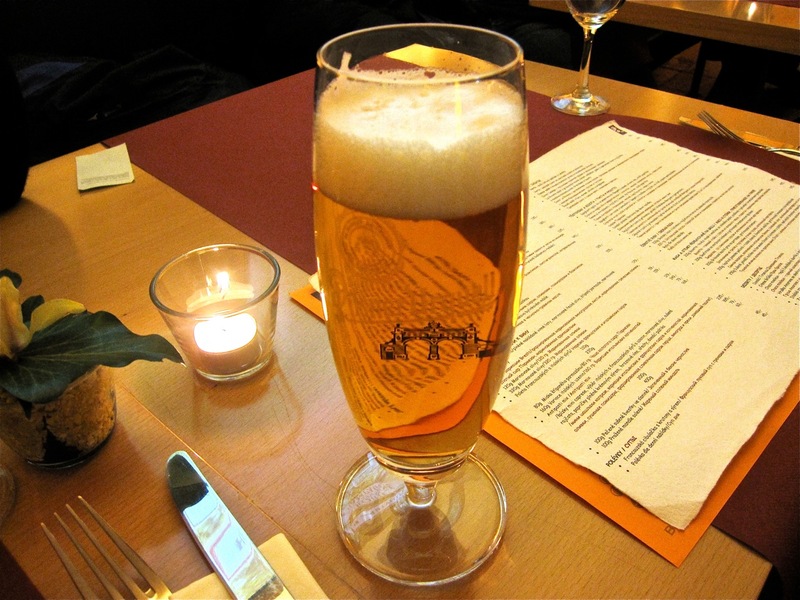 We shared a few .4 liter glasses of Pilsner Urquell (39 CZK) to start things off. JG's starter of grilled eggplant with sheep cheese (129 CZK) was pretty good. 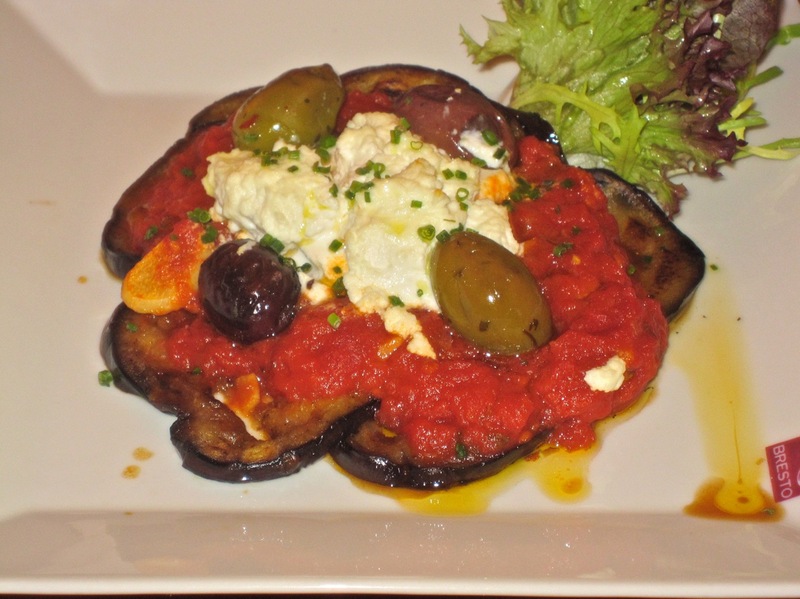 The thin-sliced aubergine was topped with a rich tomato sauce and some plump olives. The warm, creamy cheese was the star, with the eggplant and sauce fading into the background. 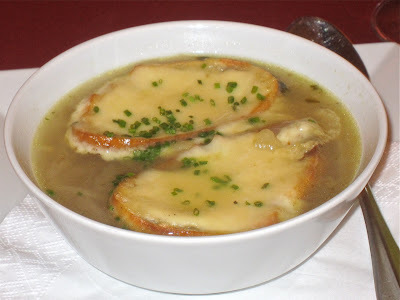 I sampled the French onion soup (45 CZK). This was my first real disappointment. I expected the usual brown, aromatic broth flavored with wine and caramelized onions. This version seemed more Czech to me. I found it bland and boring, and JG agreed. JG had the La Riviera Salad (159 CZK). 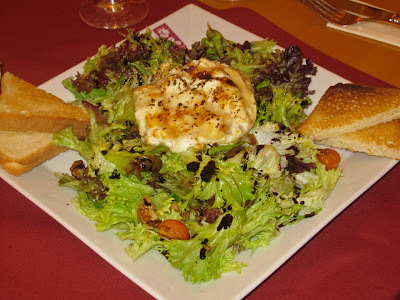 It came with grilled goat cheese, walnuts, and roasted cherry tomatoes with honey-balsamic dressing. JG complained that it was underdressed, but I thought it was fine. I always find white toast to be a boring complement. The cheese was good, but overall, it was unexciting. 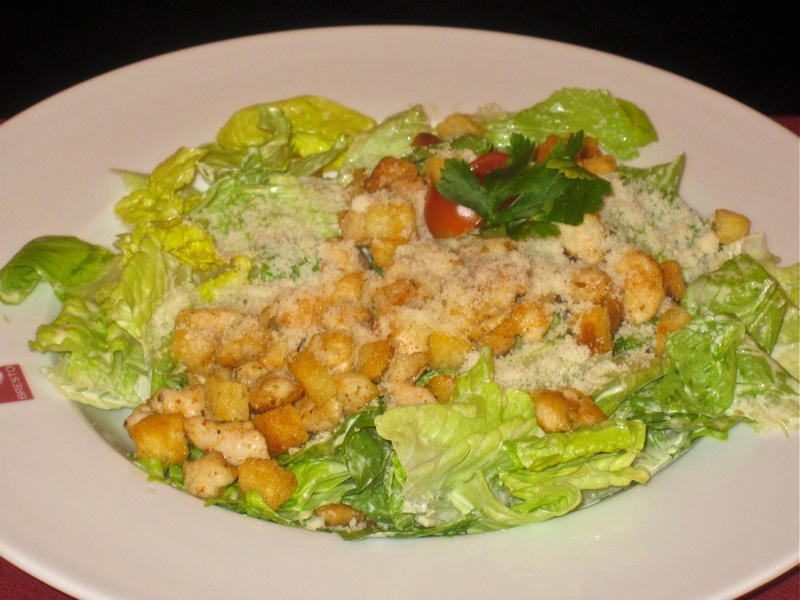 EP had the chicken Caesar salad (139 CZK). I didn't taste it, but EP was not impressed. It was rather limp, and just an average iteration. Nothing special. I had the black risotto with cuttlefish ink, shrimp, and candied lime (249 CZK). The rice had a nice buttery flavor, but it was overcooked. The shrimp were done properly with just the right texture, but didn't have much seasoning or taste on their own. The few small bits of lime were an interesting touch. 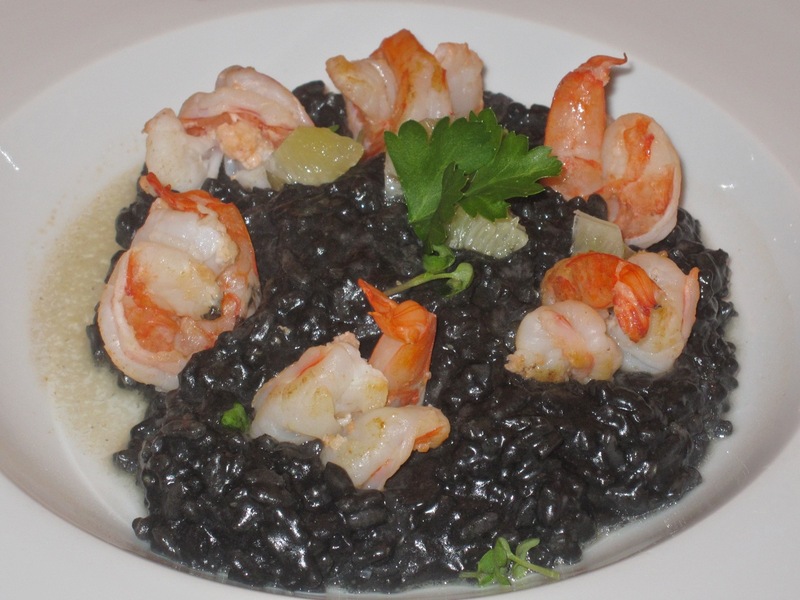 It was OK, but not as memorable as the risotto at Zelena Zahrada. This bill for the three of us, which included four beers and a couple of glasses of wine, was only 1062 CZK. Service was good, but was better on the first visit than on the second. 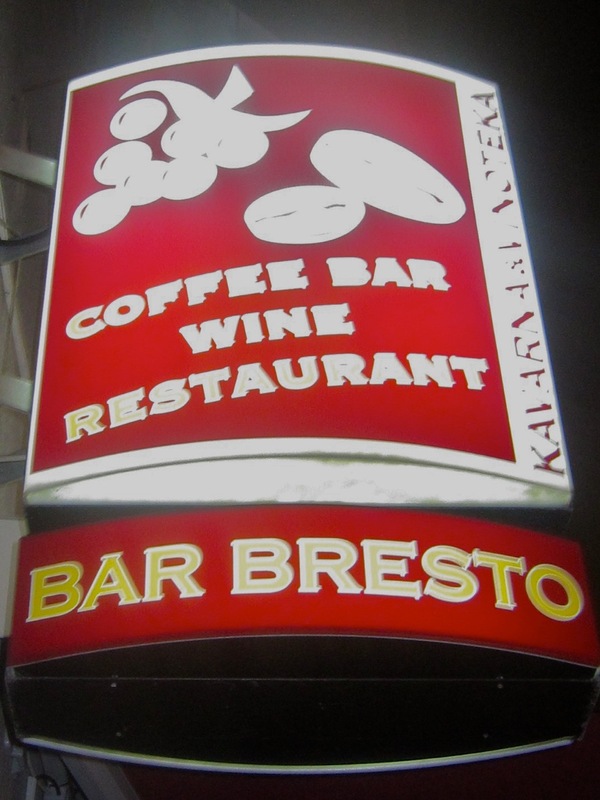 If I had only experienced the first meal, I'd give Bresto a big rave. The second trip was a little anti-climactic, but still, there is a lot of good to be found there -- more than most places. I think the prices are reasonable for the quality. 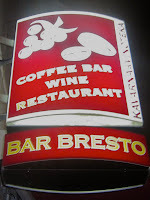 Now, I'm recommending Bresto, even though I've had to endure an "I told you so" and a "what took you so long" from a friend. So I've finally gathered the facts and formed a fair opinion. It just took a little longer than it should have. The first meal looked way better than the second. I've been away from Prague for close to 5 years, but my husband and I are planning a trip for this fall (October or November - hoping Nov because of the Christmas Market). Love your reviews. Just wondering if you'll make it to Pizzeria Kmotra near the Tesco or the Banana Leaf so I know if they are as good as I remember. 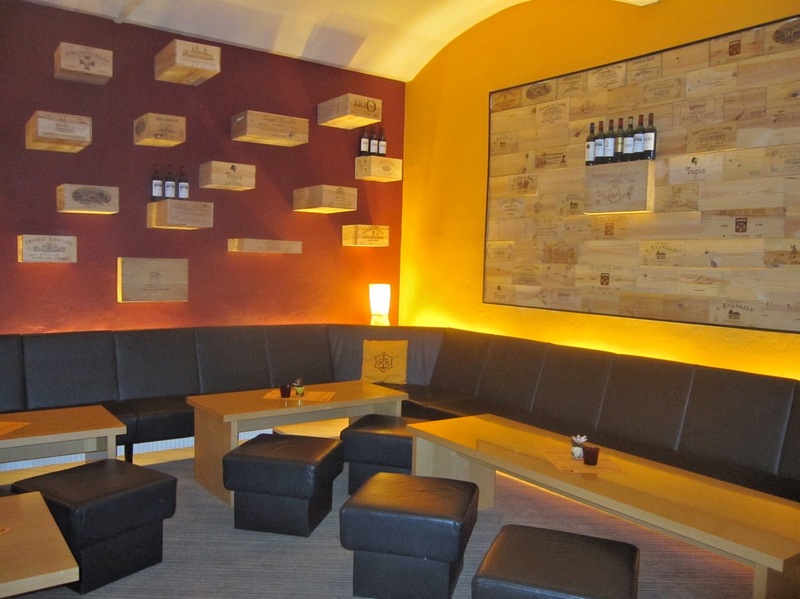 Also Restaurant Beograd on Vodičkova. And Kabul, the Afghan place on Karolíny Světlé. Their pumpkin dish was to die for!! I went to Kmotra once - decent pizza but wasn't in review mode and can't recall much about it. I think maybe you meant Lemon Leaf (rather than Banana Leaf). Still haven't been to the others you mentioned. 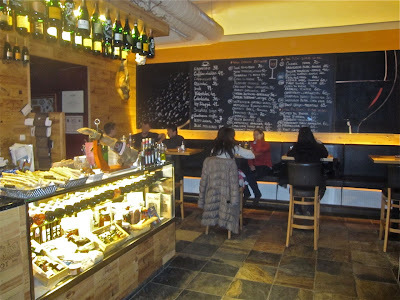 As long as its request hour :) If you ever make out to Ceretto (Cescomorasvka metro), its by far the best italian around, meaning quality meat, fish and pasta (yestheyhaveastonewoodfirepizzaovenaswell), would be interesting how that ranks on your scale, thanks.